Who doesn't love a fresh bouquet of fragrant blooms, and equally hate their hasty demise? I've spent too many years of my adult life creating flower arrangements, only to have them wilt within a day or two. In the last year I've spent a lot of time researching and testing different methods to naturally elongate the life of cut flowers and today I'm sharing my 5 favorites. 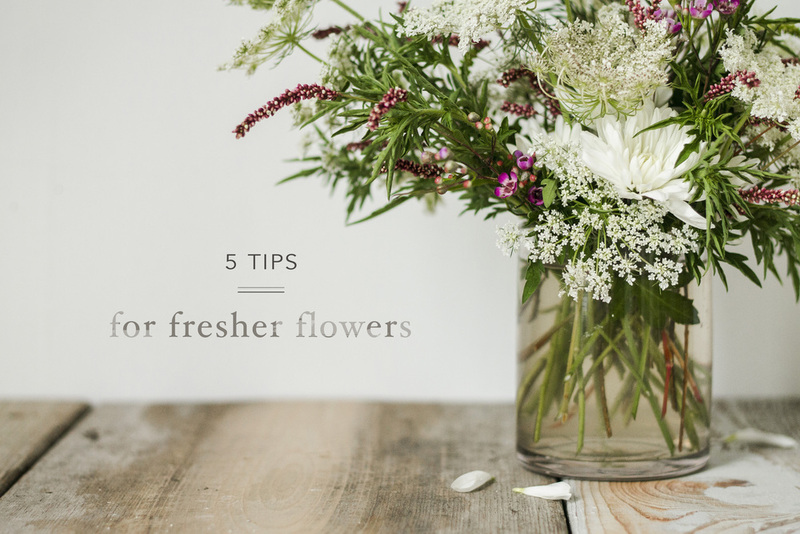 Bacteria is the number one killer of blooms, so the tips below focus on minimizing its growth and keeping your flowers as good as new. 1. Cut flowers at a 45° degree angle- The angle creates a wider surface for the flower to drink, and eliminates the risk of bacteria, the two main issues caused by a stem cut straight across the bottom. 2. Treat freshly cut flowers with hot water- Immediately after cutting the stems put your flowers in hot water and place them in the fridge, this is called "hardening." This process supercharges your flowers, perking up the drooping heads and opening the tight buds. 3. Add 2 tbsp. apple cider vinegar, 2 tbsp. sugar, and a dash of bleach to water- The vinegar and sugar balance the water's pH to keep flowers fresher longer, but increases the chance of bacteria. Adding the bleach removes the bacterial risk and gives your flowers the best chance at a long happy life. Just keep a 3-to-1 ratio in mind when mixing water with these ingredients. 4. Refresh the water every couple days- The water in your bouquets will become stale and breed harmful bacteria if left stagnant for too long. Avoid this by refreshing the water every couple of days and removing the dead blooms. 5. Place flowers in the fridge- Having a dinner party on Saturday but only have time to arrange your centerpieces on Wednesday? Stick the entire arrangement in the fridge to slow the decay process to a crawl. Just make sure your fridge isn't too cold, and you have enough room leftover for all your groceries! These tips are easy to follow and the results will amaze. If you know of any other floral longevity secrets I'd love to hear them. - b. Resources: Scientific American | Wiki How | | Read more of my flower arranging tips here.